Jacky Merilan is a Redemptorist student stationed at the Redemptorist Mission House in the Bronx, NY, and studying at St. John’s University. He is a native of Port-au-Prince, Haiti. His parents and several other family members lost their homes in the January 12, 2010 earthquake that leveled the city. The Redemptorists’ parish of St. Gerard was also destroyed and the Redemptorist students’ residence was reduced to rubble. I write this letter one year since the devastating earthquake that shook Haiti. On that day, indeed, life changed dramatically for Haitians and for all those, like me, who call Haiti home. It is hard to watch as Haiti has seen little-to-no improvement, and experienced setback after setback: political unrest; crippling sickness and illness, such as cholera; rising prices and limited resources of food, water, shelter, etc. These are the realities that my family and so many others deal with every day. Though not much has been accomplished in Haiti, one thing, I know, has remained steadfast — your prayerful, loving support and your generosity. I thank God for everyone who has lifted their prayers toward heaven or sent a word of kindness in a letter or a phone call asking how my family is doing. January 12 has become part of our history, and while on this day there is much to mourn and still much pain, instability and confusion, I would be mistaken if I failed to note that there is much hope in Haiti. While the rubble still remains as a reminder of yesterday, new life urges us to dream about tomorrow. And while we suffer from hunger, thirst and illness, we see the generosity of people all over the world sharing their time, gifts and energy with Haiti. While we see a country in uncertainty, its people still believe that with unity there is strength. Again, let me stress how thankful I am, beyond what words can truly describe. Please continue to pray for Haiti, especially today and this week, as we remember. Please continue to pray for peace, healing and comfort. 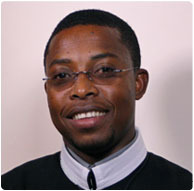 Jacky is a member of the Redemptorists’ English-speaking Region of the Caribbean, and professed his first vows in August. enter "Haiti" in the memorial box.